Do you know what's happening in the industry right now? 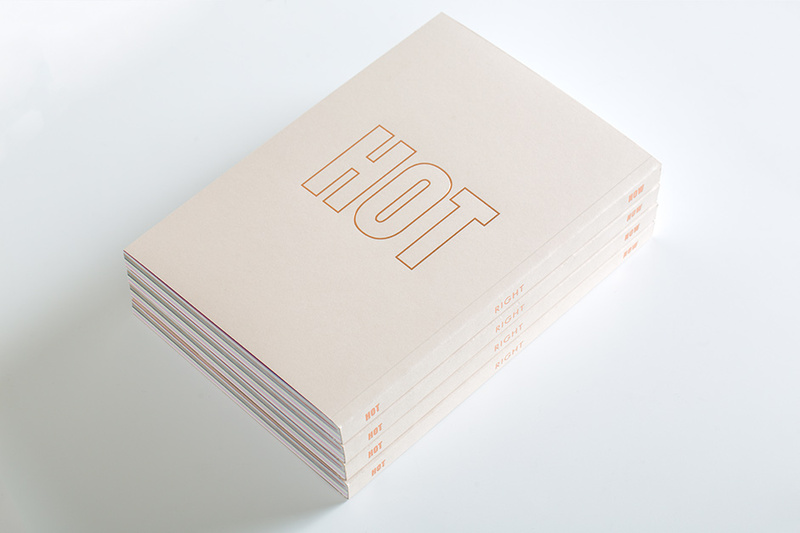 All is revealed in the hot new books from Awwwards and this time we are offering something different. 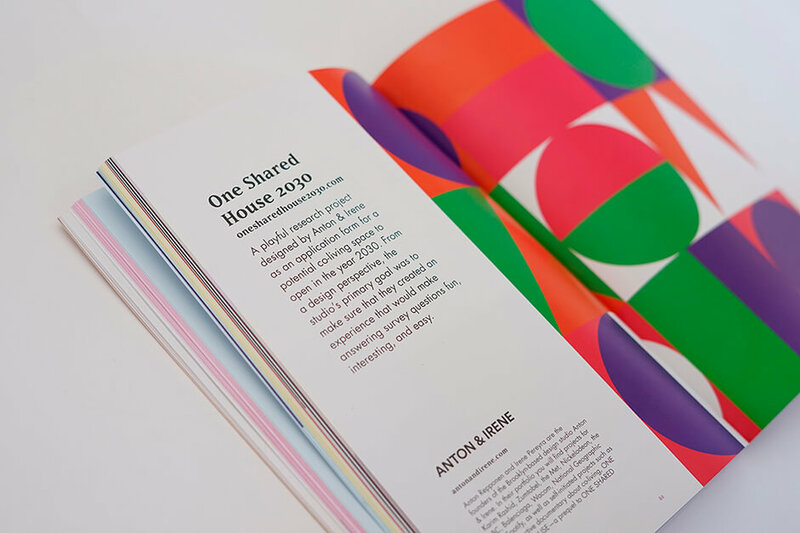 As well as the usual 365 best websites around the world we have put together an unparalleled look at the current trends in digital design, gathered from surveys and studies, in our new book on sale now here - NOW. A Contemporary Landscape for Digital Thinkers. This pack of books encapsulates the true essence of the web right now. This book is made up of 2 parts: Part One, Digital Design Now analyses the current landscape in UX design, usability, and web technologies. 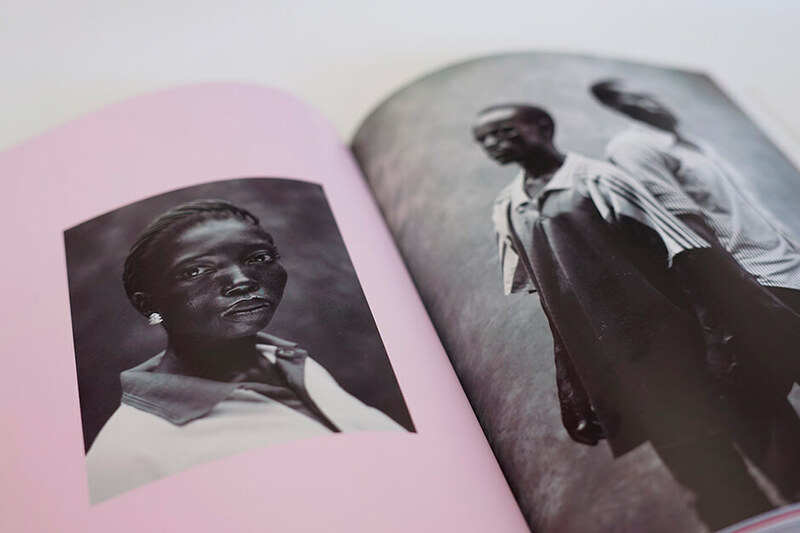 It takes a look at visual trends of note and their influence on the design of digital products. It contains analysis of themes such as the integration of artificial intelligence in our digital products, the paradigm change that this is likely to cause and how design processes will be affected. It delves into the rise of voice- based interfaces, image recognition, chat bots and other new forms of interaction that will substitute a great deal of our graphic interfaces. The book also analyses the challenges we will face when designing AR and VR experiences, such as the state of technology and available web solutions such as WebVR and WebAR, and their standardisation process. Other themes include design systems, voice and tone, microinteractions, and designing for inclusion and accessibility. 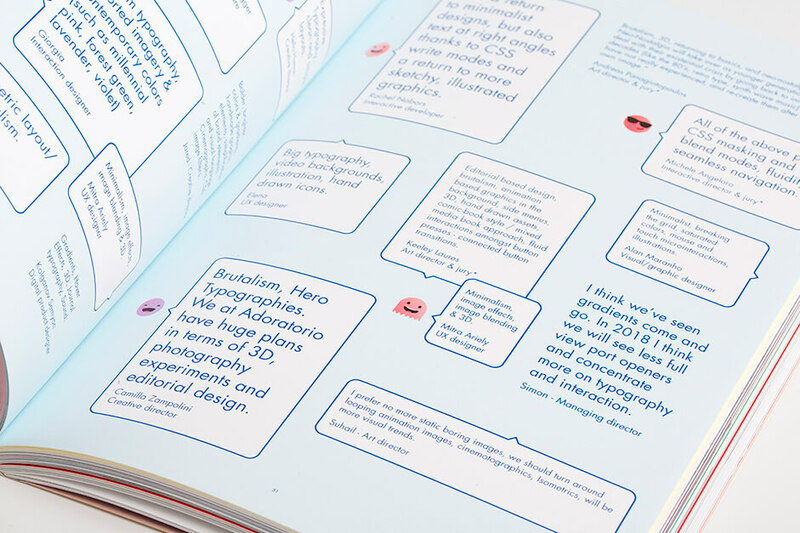 Part Two Visual Trends highlights the most common trends, such as bold and hero typefaces, brutalism, maximalism, gradients, emojis, broken grids, and asymmetric layouts illustrated with numerous examples. Taking a closer look a web technologies, the central themes this year have been: designing for performance optimization, PWAs and of course Css Grids, Flexbox, and the promising Variable Fonts. 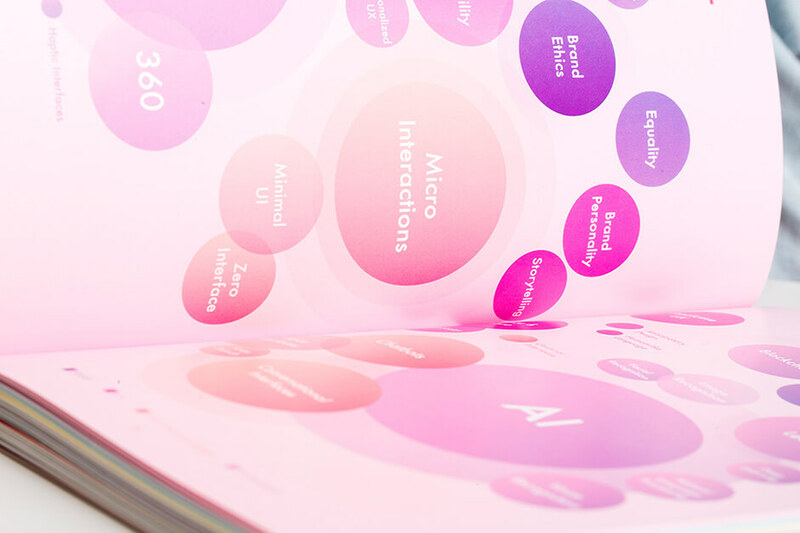 We also reveal the results of the Awwwards Trends Survey, presented in infographics giving a snapshot of what’s being used in different areas, with graphics showing data about the uses of tools and software, libraries, programing languages, frameworks, hosting providers and the most popular prototyping tools used by our users. Finally, we wanted to give a voice to our community so we have created a type of chat visual sharing the most interesting opinions from users and judges. 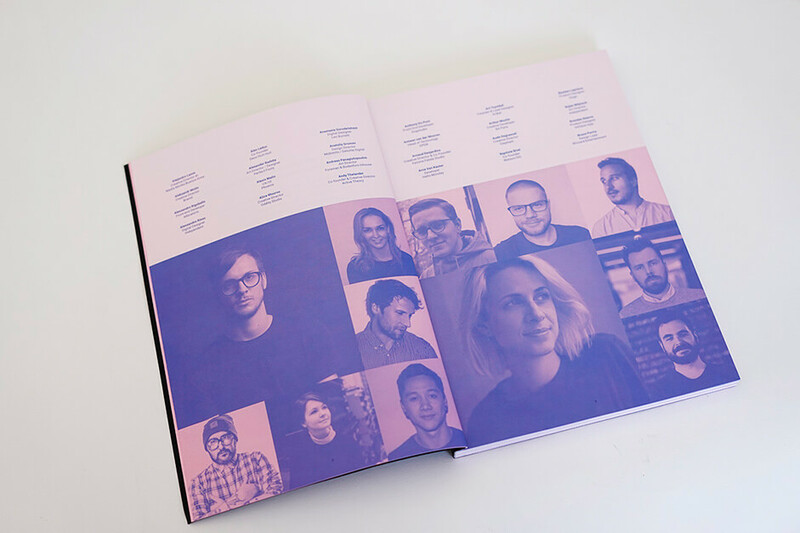 In the making of our books, we had the pleasure of collaborating with some of the annual award winners of 2017: Merci-Michel (Site of the Year), Resn (Agency of the Year), as well as past winners: Hello Monday, Active Theory, Watson/ DG and some of the most awarded agencies on Awwwards including: Shiftbrain, Bonhomme, Anton & Irene, Makemepulse, DDB, Google Brand Studio and Fold Studio, who shared their knowledge and experience, revealing the tricks, techniques and processes behind the production of their spectacular projects. 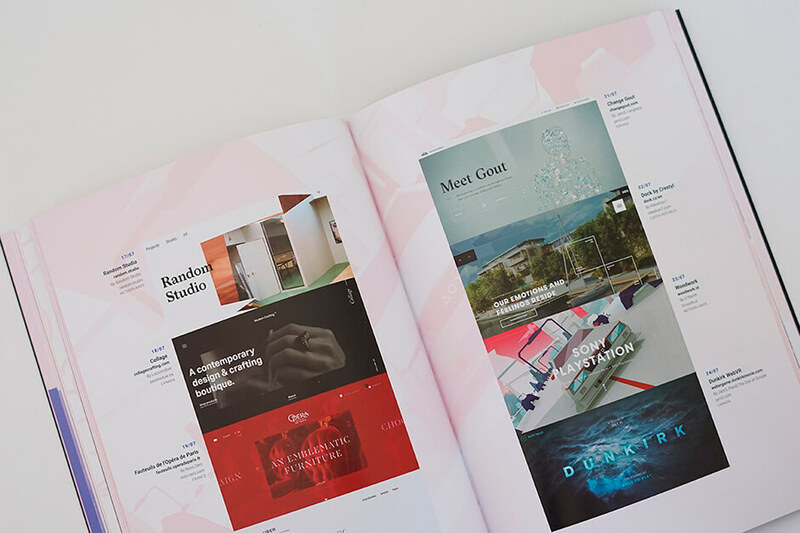 Featuring a foreword from Dann Petty - This collectors item showcases the every single award winning site of the year, lists the Jury and features the technologies used and thinking behind used on each Site of the Month from each of the agencies. A collection that encapsulates the true essence of the web in 2017. Creators, we're the ones contructing this digital display of imagery and typography that you see here, the very pixels that everyone enjoys to scroll.